An Automatic Identification System, or AIS, has become an indispensable tool for navigation and safety at sea. 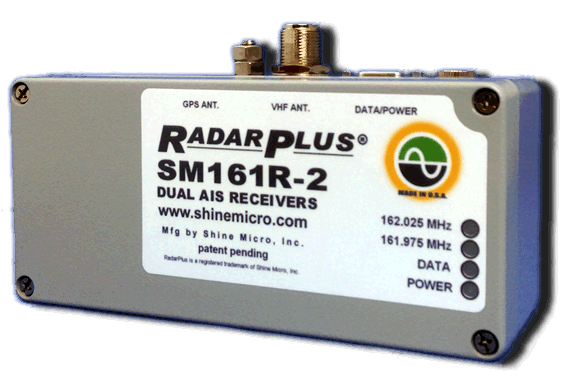 Information gathered by the RadarPlus is more detailed than radar and enables the everyday boater to see what's coming long before it is in line of sight. 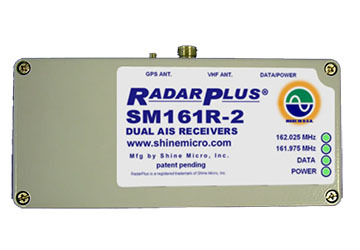 The rugged, industry standard SM161R-2 series incorporates dual stage RF input protection to provide superior protection against near lightning strikes and high power transmitters. In addition, with a receiver sensitivity of -113dbm the SM161R-2 is even better than it's predecessor, SL161R. Temperature Range: -15 to +55 degrees C.
The serial interface of the RadarPlus is a subset of IEC specification 61993-2, using a 38.4 kbps connection to a host computer. The received AIS messages are output using the VDM sentence, and GPS location data is output using the NMEA 0183 sentences. To request full serial interface specifications, please contact us or call Shine Micro at (360) 437-2503. Mount the SM161R-2 according to the provided mounting diagram. Connect the power cable to a 12 volt power source. Connect a VHF antenna to the Type N connector on the SM161R-2. Optionally connect the serial interface cable to a PC or other AIS display device. Shine Micro warrants its products to be free from defects for one full year from the date of purchase. Shine Micro will, at its sole discretion, repair or replace any components that fail in normal use. Labor and material costs for such repairs or replacement will be free of charge. This warranty does not cover failures due to abuse, misuse, accidents, or unauthorized alterations or repair.